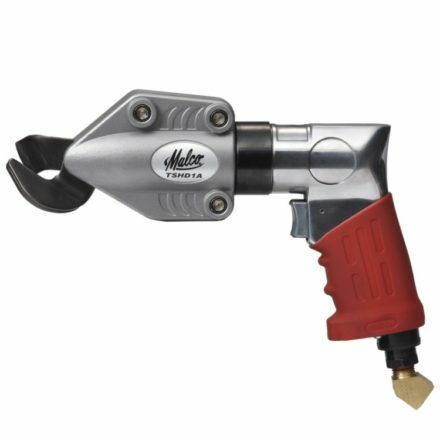 Make fast, accurate cuts in fiber cement siding anywhere on the job with a versatile and powerful TurboShear Drill Attachment. Malco’s one-hand operation fiber cement shears quickly insert into the chuck of a corded or cordless electric drill or impact driver. Smooth, easy one-hand operation always leaves a free hand to steady the work when making cuts on a bench or scaffolding. A wide skid-plate on the head design stabilizes cutting action for extra-smooth results in 5/16” (7.9 mm) fiber cement siding plank. Malco’s versatile fiber cement shears also navigates curved-pattern cuts for window and door arches. One blade and skid plate set will last an average of 30 residential siding projects. You can even rotate the tool’s skid plate to maximize acceptable cutting life. And the long-wearing blade and skid plate are also easily replaced on the job. A sleek, lightweight aluminum cast shear head and molded drill clamp allow maximum portability and ease to go wherever the work is. The patented compact telescoping drill clamp adjusts to fit both length and width of the drill housing including smaller bodied impact drivers. Optional spacers are stored on clamp for larger motor housing. The clamp collar allows the shear head to be rotated 360° and set in any position for optimum tool clearance or to facilitate easy material flow. Lightweight Shear for One Hand Control. Telescoping Clamp Fits Large or Small Drill Housing. Available in handy carrying case. A must-have for installing all Hardi products. I've been stripping off the wood clapboard siding on my house and replacing with Hardie Plank one side per year. The first year I used a $7 10" disposable fiber blade in my chop saw and a 4" angle grinder with a cement cutoff wheel. Dusty, messy - required a shop vac and respirator, made huge dust clouds and coated everything. The second year, I purchased a 7.5" fiber cement blade for my skill saw and used a sawzall with demo blades. The job went faster with less dust but still not ideal. This year, I bought this turboshear tool and a keyhole saw and can say that I am twice as productive with NO dust and mess. The first thing you need to do is ditch the rubber boot and make sure the chuck is tight otherwise it will loosen often and slow you down in the cut. I use an older 18V Dewalt cordless drill and one battery can last the whole day. I've experimented with low vs. high speed with the drill and find that high speed works very well for straight cuts. For cutouts around window sills and such, this can get in there and you can do shapes if you go slower and take your time. For the last little bits and inside corners to clean up, the keyhole saw finishes up the cut with only a few pulls. Of course, the life expectancy of the keyhole saw is greatly reduced but the lack of a mess and speed of the job make up for it. I just finished re-siding a dormer with hardiplank, using this tool. I bought from toolbarn.com because they sell it with a carry case. Mounted by hand on my cordless drill so it's very portable, but also works with corded too. Pretty much cut the hardiplank like butter and almost no dust. When I received this tool I was pleasantly surprised to see it was made in the u.s.a. This has been a really tough tool as well. I would buy this tool again.